Most of the fields on your website can be edited using Rich Text Editors. (see image below). Rich Text Editors are sometimes know as a WYSIWYG Editors, which stands for What You See Is What You Get. If you are familiar with popular word processing applications you will readily recognise some of the functions of the Rich Text Editor. Change Text and Background colours. Most of the images on your site will be located in your galleries, however you might want to add images into other locations on your site. 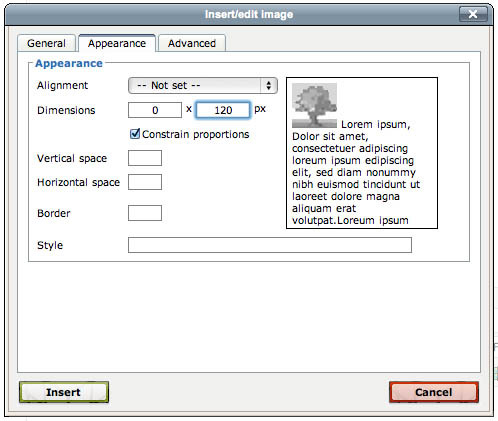 Images can be added to any location that can be edited with a Rich Text editor. STEP 1. To start you will need to upload an image to one of your galleries and then get its URL. (it is ok to upload images into "hidden" galleries that can not be seen by visitors to your site). STEP 2. Copy the Image URL which is displayed on the "Edit This Image" page (about half way down). It will look something like this: http://arthives.com/files/1003/20051192823523_11.jpgMake sure you copy the whole URL from "http to .jpg" otherwise it won't work. STEP 3. Go to the Rich Text Editor where you want to insert your image. STEP 4. Click the spot in the Rich Text Editor where you would like the image to appear. STEP 5. Click the "insert/edit image" icon - the little green tree (see image below). STEP 6. 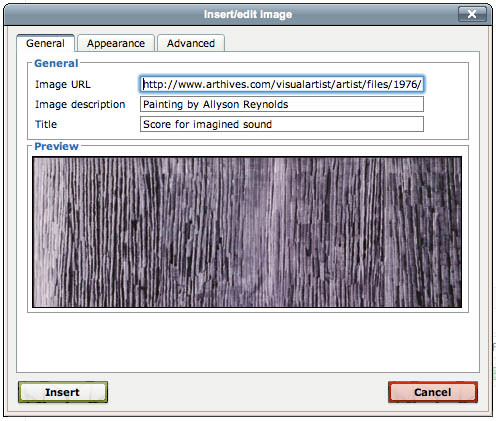 In the popup box, Paste your Image URL (from step 2) into the "Image URL" field. Its best to also type an image Description and Title into the other 2 fields. STEP 7. * Next click the "Appearance" tab and enter the display "Dimensions". STEP 8. Click the "Insert" button which will close the pop-up window. STEP 9. Don't forget to Click the "Update" button at the bottom of the page to save changes. *Step 7 is only necessary if you want the image to display at a different size than the actual size of the image you uploaded. You will only need to enter the width or the height if you leave "Constrain Proportions" checked on. If you are inserting an image to use on your Galleries index page, try setting the height to 120px. STEP 1. Highlight some text in your Rich Text Editor. STEP 2. Click the insert/edit link icon. (see image below). STEP 3. In the pop-up box enter the Link URL for the page you wish to link to. 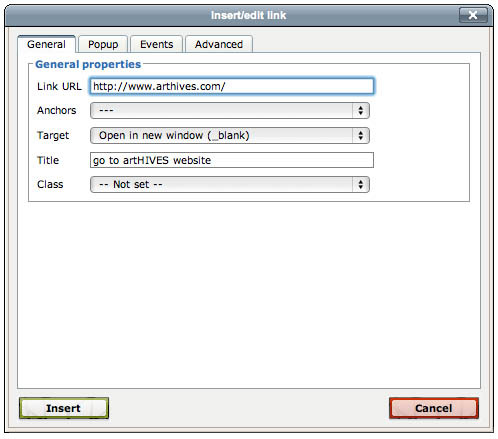 It is better to copy and paste the URL directly from the Link page to avoid errors. STEP 4. From the dropdown menu choose a Target option. - Choose "Open in this window / frame" when linking to a page within your own site. - Choose "Open in new window (_blank)" when linking to another website. STEP 5. Click the "Insert" button which will close the pop-up window. STEP 6. Don't forget to Click the "Update" button at the bottom of the page to save changes.